Chelsea forward Eden Hazard has decided against penning a new contract with the west London side, meaning that he could leave on a free transfer at the end of next season. 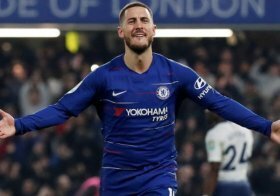 The Belgium international has been with the Blues for nearly seven seasons and he is currently enjoying his best-ever campaign with a combined 28 goals and assists in the Premier League. Despite this, he has shown no intention of penning a new deal at the club and The Telegraph claims that the stance is unlikely to change irrespective of the club's two-window transfer ban. Chelsea are currently said to demand at least £100m to sanction the attacker's sale in the summer, but so far, there have found no suitors with long-time admirers Real Madrid reluctant to match the price tag. In this case, the Blues could risk the Belgian for the final year of his contract next term in the hope that the attacker has a change of thought in the situation. Hazard is set to feature for Chelsea in the midweek Europa League clash against Slavia Prague.